Rasmus Bertelsen and Lars Moller (1874-1921), editors. Atuagagdliutit Nalinginarnik tusarumindsassunik inivkât Godthab, Greenland: L.Moller, 1861-1921. 639 issues in 51 volumes, 4° (254 x 203mm. and smaller). Numerous plates and illustrations, including 324 lithographs, 42 printed in colours or hand-coloured, on 249 leaves, 21 folding, 8 double-page, by Moller, Aron of Kangeq and others, first four volumes with contemporary manuscript indices bound at front. (Occasional small tears, a few plates shaved with slight loss to image area.) Variously bound in modern half morocco (1 vol. ), contemporary half roan (3 vols. ), original cloth-backed boards (1 vol.) or original variously-coloured wrappers (46 vols), (some small tears to backstrips. A very rare complete run of this Greenland Inuit-language newspaper: probably the last set to remain in private hands. The Danish geographer Hinrich Johannes Rink (1819-1893) settled in Greenland in 1853, initially as factor and later as Royal Inspector of South Greenland. His abiding interest in, and empathy with the Inuit led him to the conclusion that their culture was in danger of being submerged under the growing tide of European influence. In an effort to cultivate an awareness of the importance of their own language and customs, Rink, together with Samuel Kleinschmidt and E.Janssen, undertook the publication of an Inuit-language newspaper. 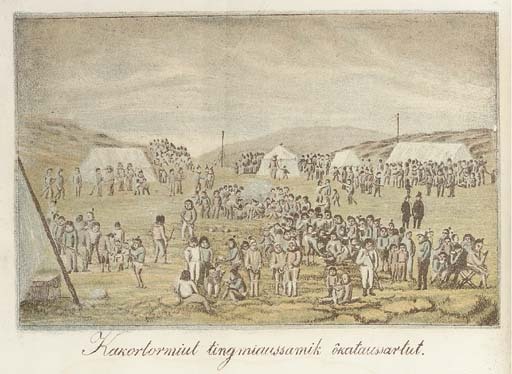 Atuagagdliutit was the result: edited and printed from the start by native Greenlanders. From 1861-1874 it was editied by Rasmus Bertelsen, and from 1874 onwards by Lars Moller (who was also the printer). The newspaper was a monthly publication with a limited print run (the first twelve issues were limited to 200 copies) which was distributed to the various Greenland settlements once a year. Its immediate popularity ensured both its longevity and that few complete sets have survived: copies were generally read until they fell to pieces and the plates were removed and used as decoration. The newspaper included a mixture of local news, official edicts, current affairs, hunters' stories, classic european literature and Inuit myths. The physical difficulties of printing in the extreme climate of Greenland can be easily imagined, but the intellectual problems that had to be overcome are perhaps less obvious. Stories of european life provide a good example: in many cases words had to be constructed as the Danish word had no equivalent in the Inuit language. The majority of the charming lithographic plates are by Moller, but there are also a number by Aron of Kangeq (1822-1869). The images are drawn from a mixture of sources. The most interesting are those which illustrate the landscape of Greenland and the Inuit way of life, but also included are a wide range of copies from printed sources: buildings, events and people in Denmark and elsewhere in the 'civilised' world, natural history images of a wide range of animals and a series of four colour-printed lithographs of native Americans by Moller after George Catlin. J.C.Pilling Bibliography of the Eskimo Language (Washington: 1887) pp.6,40-41; Rink Danish Greenland (London: 1877) pp.213-214.